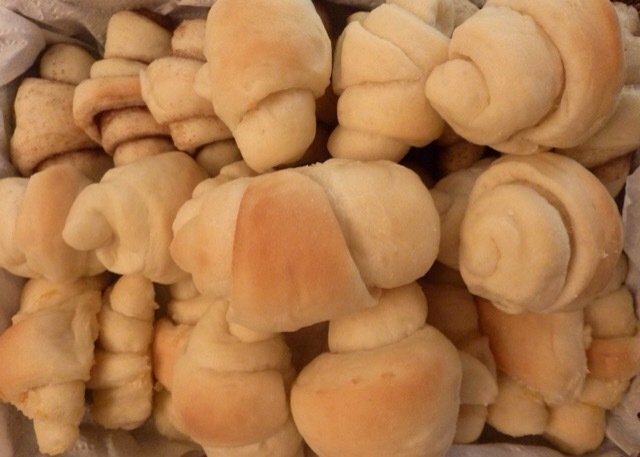 One of the most popular items on our Thanksgiving table is fresh homemade yeast rolls. Some are plain, some are filled with cinnamon sugar, some with orange sugar. At this high altitude yeast rolls rise so light and fluffy that even a double batch disappears quickly. My children like to help form the rolls. I have found that the easiest method for making them amidst all the food prep of Thanksgiving morning is to mix the dough the night before. Spoon it into a food-grade bucket with a lid, or a bowl with a tight plastic cover, and let slowly rise overnight in the refrigerator. The next day bring the dough to room temperature and then shape into rolls. There are instructions below if you prefer not to do the overnight method. This recipe is adapted from the cookbook A Pinch of Salt Lake by the Junior League of Salt Lake City. In a small bowl combine yeast, 1/4 tsp. sugar, and warm water. Stir and cover with plastic wrap. Let sit 5 minutes to foam. In a mixing bowl combine 1/2 cup sugar, eggs, warm cream, melted butter, and salt. Add yeast mixture. Mix well. Add flour one cup at a time. The dough should be sticky. Pour into a buttered bowl or food-grade container with a lid. Refrigerate overnight. The next day allow the dough to come to room temperature on the kitchen counter. This should take 2-1/2 to 3 hours. If you want to make the dough and bake the same day, mix the dough and let rise, covered tightly with plastic wrap, for 1-1/2 hours until doubled. Divide dough in half. Take one dough half and roll out on lightly floured surface into a 14-16-inch round circle. Brush dough with 1-2 Tbsp. melted butter. At this point you can add half the flavored sugar of choice or leave it plain. Cut into 16 wedges as if cutting a pie or pizza. Roll up each pie slice-shaped piece of dough from the perimeter edge down to form a crescent. Place on a parchment- or silpat-lined baking sheet. Repeat with the remaining dough. Cover with a tea towel and let rise for 1 hour. Bake in a preheated oven at 350 degrees for 10-12 minutes until lightly golden, rotating the pan half way through baking. Transfer rolls to a rack. Makes 32 rolls. Note: It is optional to roll the dough into a large rectangle 16 inches long. Brush with butter, fill with sugar mixture if you want, then just roll up like a jelly roll. Slice with dental floss into 24 individual rolls. Place close together in a parchment-lined 9×13 metal pan. Then let rise before baking. You can also glaze cinnamon or orange rolls with the following glaze if desired (I usually leave them unglazed for Thanksgiving). In a bowl whisk together butter, salt, vanilla, and 2 Tablespoons evaporated milk. Whisk until smooth. Add powdered sugar one cup at a time, whisking until smooth, then add 2 more Tablespoons of milk. It should be fairly thick. Spoon over hot rolls and spread with a spatula to coat. Use all the frosting. This entry was posted in Breads, Breakfast, Christmas, Easter, Thanksgiving. Bookmark the permalink.